Lunar standstill: every 18.6 years, the declination range of the Moon reaches a maximum or minimum. Precession is the change in orientation of a rotational axis with respect to a reference plane. The orbit of the Moon undergoes two important types of precessional motion: apsidal and nodal. The axis of the Moon also experiences precession. The lunar nodes are the points where the Moon's orbit intersects the ecliptic. The first type of lunar precession is that of the plane of the Moon's orbit. The period of the lunar nodal precession is defined as the time it takes the ascending node to move through 360° relative to the vernal equinox. It is about 18.6 years and the direction of motion is westward, i.e. in the direction opposite to the Earth's orbit around the Sun if seen from the celestial north. This is the reason that a draconic month or nodal period (the period the Moon takes to return to the same node in its orbit) is shorter than the sidereal month. After one nodal precession period, the number of draconic months exceeds the number of sidereal months by exactly one. This period is about 6,793 days (18.60 years). As a result of this nodal precession, the time for the Sun to return to the same lunar node, the eclipse year, is about 18.6377 days shorter than a sidereal year. The number of solar orbits (years) during one lunar nodal precession period equals the period of orbit (one year) divided by this difference, minus one: 365.2422/18.6377 − 1. Apsidal precession occurs when the direction of the major axis of the Moon's elliptic orbit rotates once every 8.85 years. 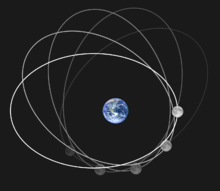 The second kind of precession of the Moon's orbit is that of the major axis of the Moon's elliptic orbit (the line of the apsides from perigee to apogee), which precesses eastward by 360° in approximately 8.85 years. This is the reason that an anomalistic month (the period the Moon moves from the perigee to the apogee and to the perigee again) is longer than the sidereal month (the period the Moon takes to complete one orbit with respect to the fixed stars). This apsidal precession completes one rotation in the same time as the number of sidereal months exceeds the number of anomalistic months by exactly one, after about 3,233 days (8.85 years). The rotational axis of the Moon also undergoes precession. Since the Moon's axial tilt is only 1.5° with respect to the ecliptic (the plane of Earth's orbit around the Sun), this effect is small. Once every 18.6 years, The lunar north pole describes a small circle around a point in the constellation Draco, while correspondingly, the lunar south pole describes a small circle around a point in the constellation Dorado. ^ Patrick Moore (1983). The Guinness Book of Astronomy Facts & Feats. p. 29. In 1968 the north pole star of the Moon was Omega Draconis; by 1977 it was 36 Draconis. The south pole star is Delta Doradus. P. K. Seidelmann, ed. (1992). Explanatory Supplement to the Astronomical Almanac. U.S. Naval Observatory / University Science Books. pp. 114–15, 701.